← Is your Life Programmed for Unhappiness? Have you ever wondered how & why your life unfolds the way it does? As you have heard me say many times, everything is unfolding within Divine Plan at the right time and way. You cannot get your life wrong. What makes this plan unfold perfectly is your Soul Genetic Imprint. The Soul Genetic Imprint within humans is stored in an area I was made aware of just recently called the Divination Line. This area of frequency is made up of very subtle layers of energy emanating out of the top of the head. 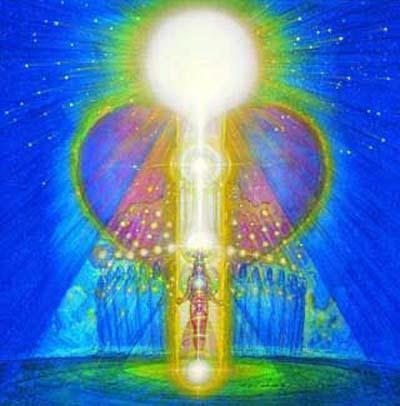 This is not to be confused with the many other energy flows and channels that extend out of the top of the head. The Soul Genetic Imprint holds all of the sequencers of the unfoldment of experiences in every incarnation you have had, are having, and will have. It is your little piece of Divine Plan that keeps you on track in every moment exactly the way you should. This is why you cannot ever get your life wrong. It can only be perceived as wrong which will impact on how you experience your divine perfection unfolding, not perfection itself. When you really think about this, you will need to question all of the plans and effort you currently put into making changes in your life. If Divine Plan unfolds perfectly, and I am directly plugged into this plan, and are totally influenced by it, then it really does not matter what I do, as it will always be in alignment to the unfoldment of Divine Plan. My life remains perfect in all moments of time because Divine Plan in imprinted into my Soul Genetic Imprint and makes it happen. Make plans in your life, but do not have expectancy of outcome. Why? Because whatever the outcome is will be right for what you have come to experience in this incarnation. What you have come to experience is not always known by the conscious mind or what society says is right. It is way beyond that. Relax! and Allow your life to unfold in its perfect way without you resisting its unfoldment because of some distorted view of what you feel is right. All negatives and burden you may currently experience is a direct result of you giving energy to distorted truth that you believe to be right. This causes the generation of more attachment, resistance, and effort to get away from what is perceived as wrong. Many people often put tons of effort and energy into getting somewhere else. They do not realise that where they currently are is perfect, and if they actually stopped trying to change and just be, life would become positive and easy. What we run from often burdens us. Anyway, this is just something else for you to consider or ponder. This entry was posted in Uncategorized and tagged Acension, consciousness, Divine Love, divine plan, energy shift, happiness, higher consciousness, philosophy, planetary ascension, spirituality, starseed, trevor gollagher, universal truth, yoga. Bookmark the permalink.